Now Elizabeth Arden Ceramide Makeup brings more colour, products and anti-ageing benefits to its collection with Ceramide Skin Smoothing Concealer, Cream Blush and eight new Plump Perfect Lipstick Shades. The Ceramide Makeup Collection is powered by the advanced treatment technology of Ceramide science. The exclusive Ceramide Triple Complex retexturises, soothes and strengthens skin's appearance, while Vitamins A, C and E provide antioxidant protection. 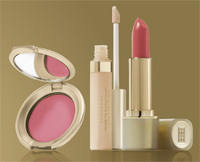 New Ceramide Makeup is now available at Elizabeth Arden counters nationwide. The future of your skin has never looked or felt more beautiful. Review: The new colours are fabulous, with smooth textures that feel luxurious, perfect for blending and creating a fresh look for spring/summer.